Skytemple Ruins is a hilltop sparsely covered with ruins directly north of the College of Winterhold. The Arms of ChaosCC: Complete a mage's quest to reassemble two powerful staves. The sparse ruins are situated at the top of a large glacial mound surrounded by water. 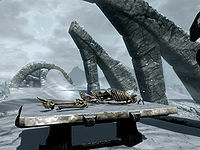 They are guarded by two archer skeletons and three melee skeletons outside, and contain one altar overlooking the sea to the west with another dead skeleton lying on top of it, along with a leveled poison. To the east, there is a small enclosed burial chamber through a novice-locked wooden door with an apprentice-locked boss level chest, guarded by a leveled draugr which is slumbering in an upright sarcophagus opposite the door you enter through. Next to the chest are a copy of the Illusion skill book Before the Ages of Man, a leveled regeneration potion, and a leveled lasting potency potion. This page was last modified on 19 April 2019, at 14:45.